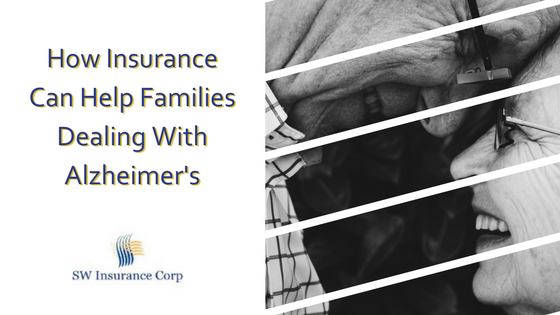 How Insurance Can Help Families Dealing With Alzheimer’s | SW Insurance Corp.
Alzheimer’s is a progressive brain dysfunction that affects about 6 million Americans, mostly over the age of 65. As the US population ages, the number of people with Alzheimer’s disease is expected to rise quickly. Towards the end Alzheimer’s can become severe enough to interfere with daily tasks and living. According to Alzheimer’s.org it is the most common form of dementia, accounting for 50-80% of all dementia cases. The costs of health care for those with this disease are enormous. There is no cure, only treatments that prolong life. Costs for caring for a person with Alzheimer’s disease or other dementias can be high, but there are steps that families can take to use their resources wisely and identify sources of help. One of the biggest sources of assistance for Alzheimer’s patients is insurance. But how do you know which insurance is right for you? Medicare is a federal health insurance program generally for people age 65 or older who are receiving Social Security retirement benefits, or who are younger than 65 and received Social Security disability benefits for at least 24 months. Medicare covers inpatient hospital care, some doctor’s fees, and some medical items and outpatient prescription drugs. Many people are shocked to discover that Medicare does not cover the long-term custodial care that Alzheimer’s patients need. Custodial care is the non-medical care associated with activities of daily living, such as bathing and dressing. For home care, the patient must require skilled-nursing care or physical or occupational therapy to help with the recovery from an illness or injury — not to help an Alzheimer’s patient with daily-living activities. Medicare pays the cost of a skilled-nursing facility, but only to provide continuing treatment following a hospital stay of at least three days. Skilled care in a facility is limited to 100 days. Alzheimer’s patients and their families need to carefully choose a Medicare Part D prescription-drug plan or private Medicare Advantage plan. Alzheimer’s medications are generally covered under Part D, but plans vary regarding co-payments. Medicaid is a program jointly funded by federal and state governments. It is administered by each state. Medicaid pays for medical care for people with very low income and asset levels, and long-term care for people who have used up most of their own money (in most circumstances). It also is available to people younger than 65 if they are disabled. Unlike Medicare, it provides custodial care for Alzheimer’s patients. Custodial care typically is provided in Medicaid-eligible nursing homes, but many states’ Medicaid programs now pay for home care and sometimes adult day care or care in assisted-living facilities. The downside: You need to be virtually impoverished to qualify. Many people end up qualifying after spending their retirement savings on care. Medigap is a secondary insurance option that can be added to Medicare. A Medigap plan will help pay for things that aren’t covered by Medicare like copayments, coinsurance and deductibles. With both Medigap and Medicare, a family can afford to care for an individual with Alzheimer’s without having to use life savings. Long-term-care insurance provides coverage for the custodial care that Alzheimer’s patients usually need. Benefits typically kick in if the patient needs help with at least two activities of daily living or if a doctor provides evidence of cognitive impairment. Because most people with Alzheimer’s receive care in their own homes, look carefully at the policy’s home-care requirements. People with Alzheimer’s eventually require constant Long Term Care services, either at home or in a nursing or assisted living facility. This often leads to draining their life savings to pay for it. Long Term Care Insurance must be purchased before the problem arises. As with many insurance policies, the older you are, the higher your premiums will be — and you may be denied coverage. For this reason, it is always recommended to look into buying a long-term care insurance policy well before you think you need it. The costs associated with caring for a person with Alzheimer’s disease or other dementias are very high. It can seem overwhelming, but there are resources available to help you.